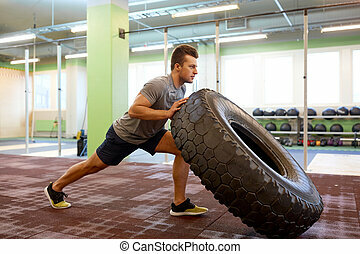 Ok, there are used commercial toyo tires near my house and I'm thinking of using one of them for "tire flips" exercise. Have you tried doing this kind of fitness technique? Is it an effective conditioning exercise? Summary: They're awesome, but choose the right tyre and work on your technique. jastim wrote: Ok, there are used commercial near my house and I'm thinking of using one of them for "tire flips" exercise. Have you tried doing this kind of fitness technique? Is it an effective conditioning exercise? They take up a lot of room in a gym, cost more (in membership fees), and is inconvenient. If you have one great, but if you're shopping for gyms or are in a crowded gym, best to try something else. Try weighted rowing machine + various weighted squats. If you got a back yard with the space and a free tire, sure, go nuts. They're decently heavy, though, and a bit awkward to transport unless you have a truck or similar.